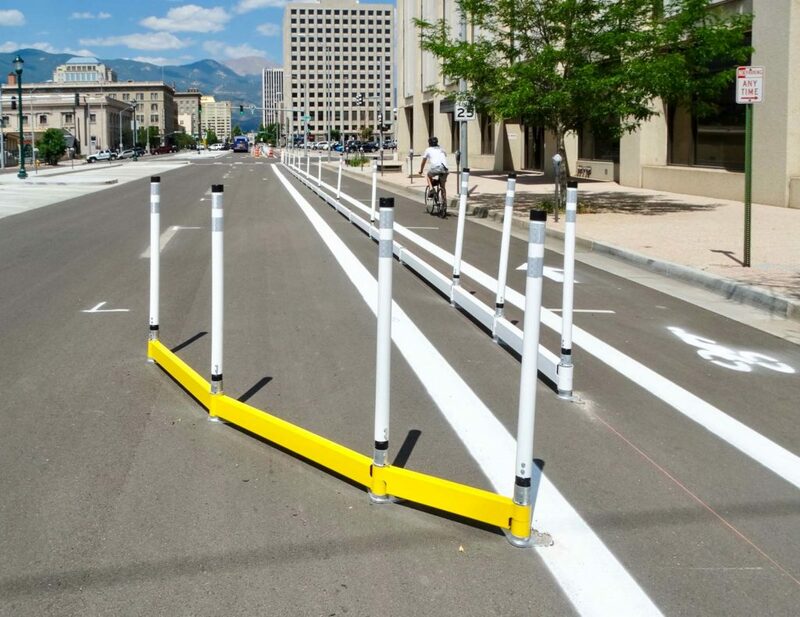 BIKERAIL™ is a strong, steel barrier system designed to create a fully protected bike lane. 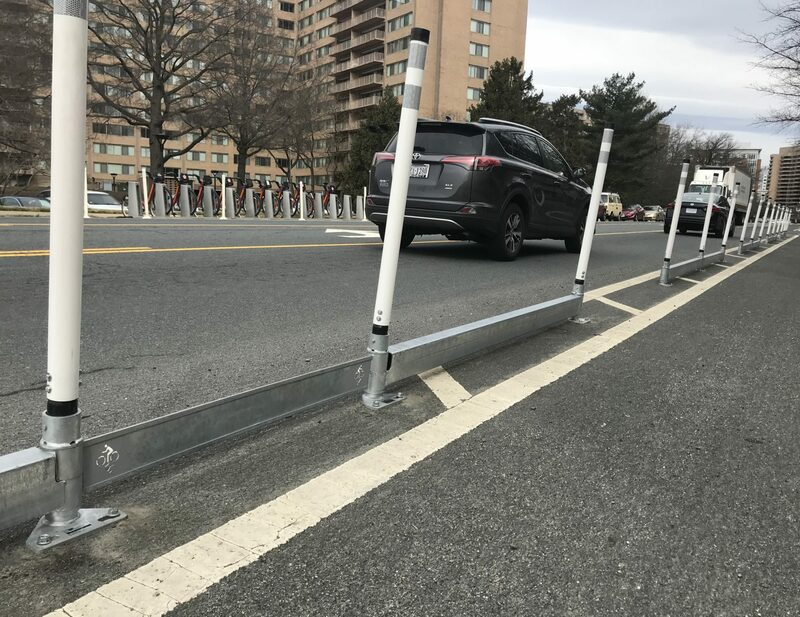 It offers the substantial protection of a concrete curb . . . but it’s a modular, quick build solution and is 100% changeable, movable and reusable. 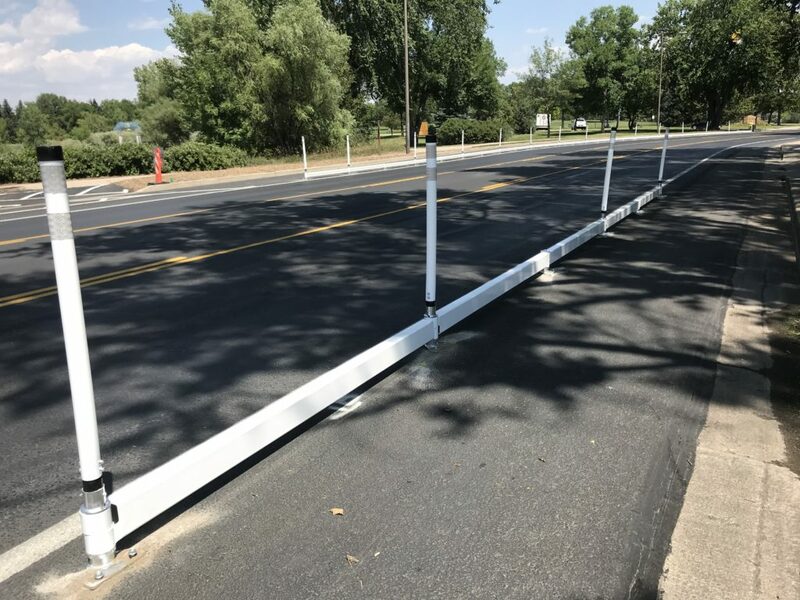 BIKERAIL’s modular, durable steel rails connect and swivel at posts to create the desired barrier configuration. 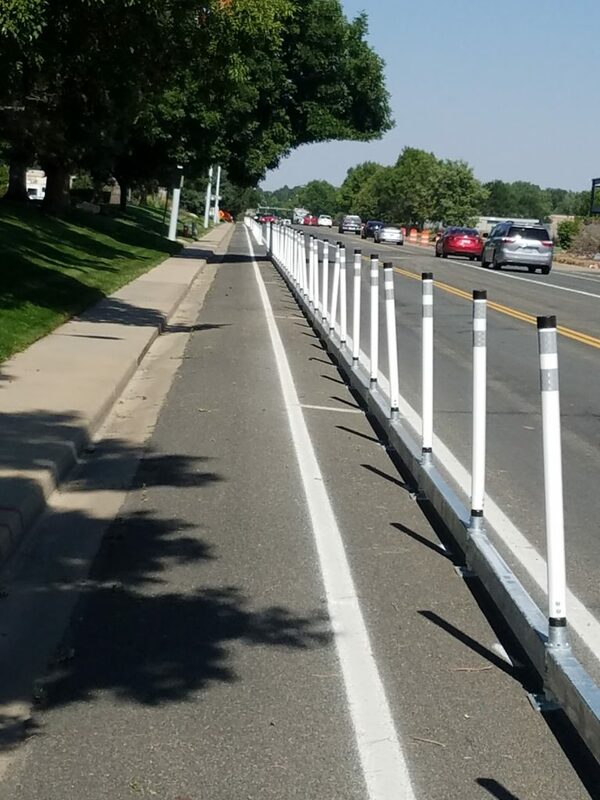 Posts have a narrow footprint (5-1/4”) to accommodate minimal buffer zones, and can be anchored into asphalt or concrete. 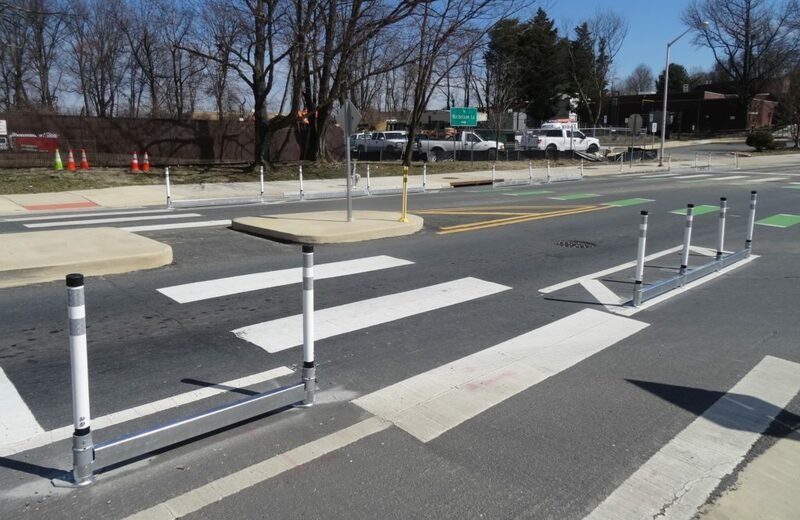 Vertical delineators can be attached to any post (specify delineator height, from 12″ to 50″ above grade). 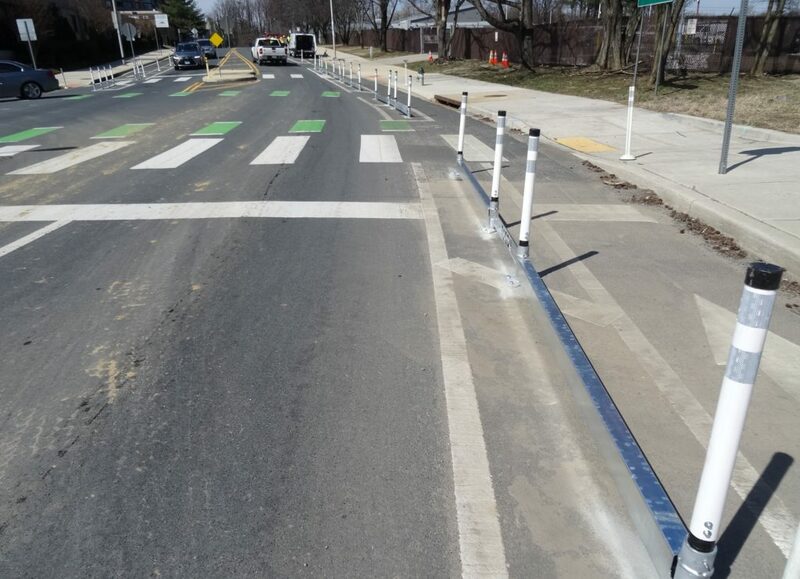 The rails sit 2-1/4” above grade to allow for storm water drainage and debris clearance. 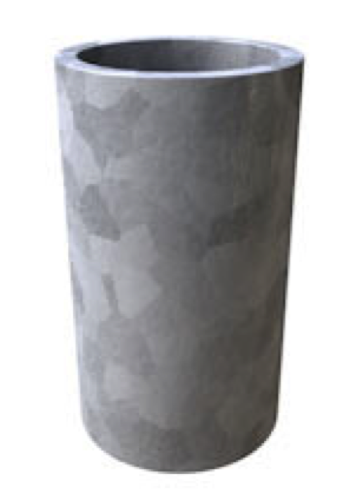 Choose galvanized or a powder coat color (over galvanized) finish. 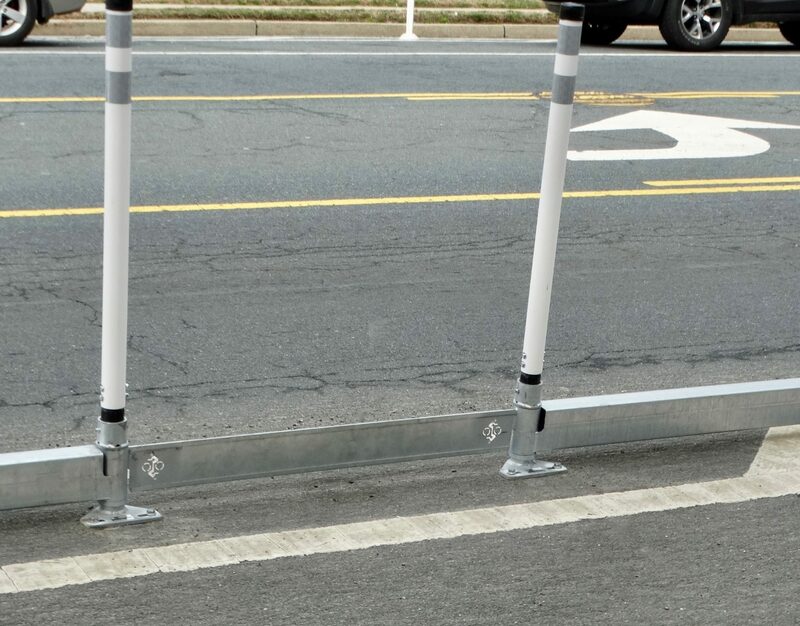 When anchored, BIKERAIL forms a strong, secure and permanent barrier. If/When it must be reconfigured, moved or repurposed, simply remove the anchors in seconds to relocate or repurpose the entire system. Time and budget often dictate a retrofit-ready solution to enhance safety without street demolition or utility impacts. 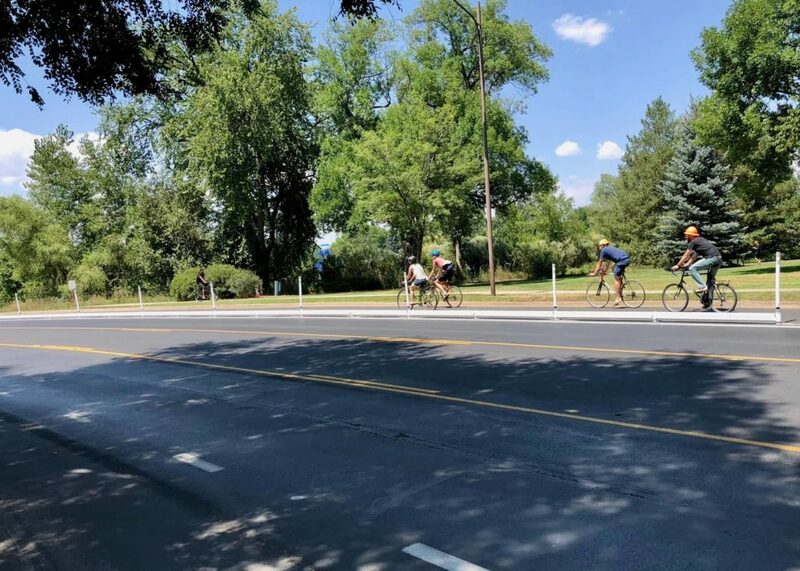 BIKERAIL installs in hours without time-consuming and expensive engineering studies and plans. 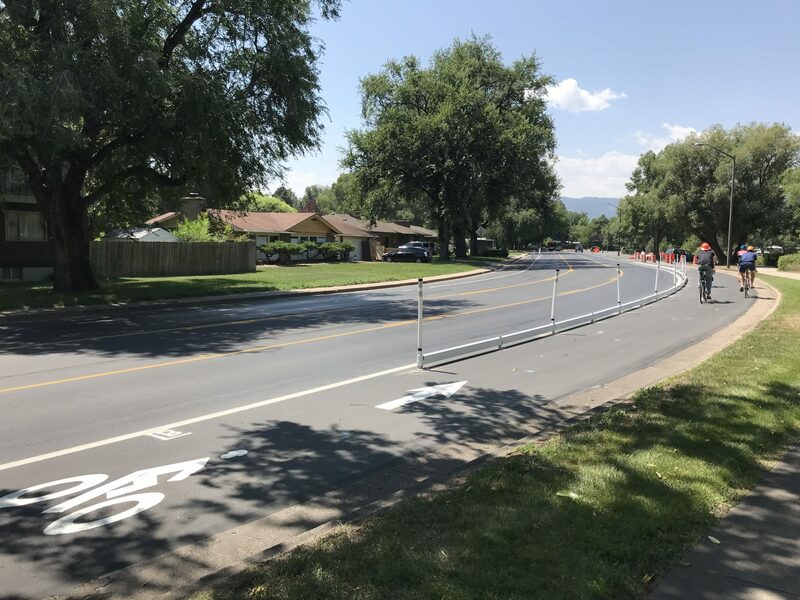 Installation crews like the quick and easy assembly, and cities appreciate the low labor costs. 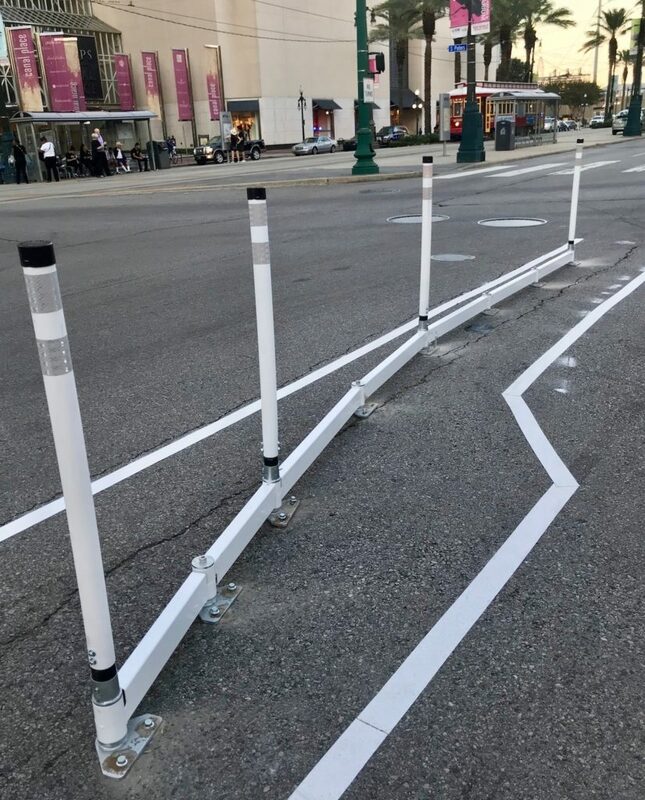 Cap & Bolt secure the Rails’ connection if no Delineator is specified. 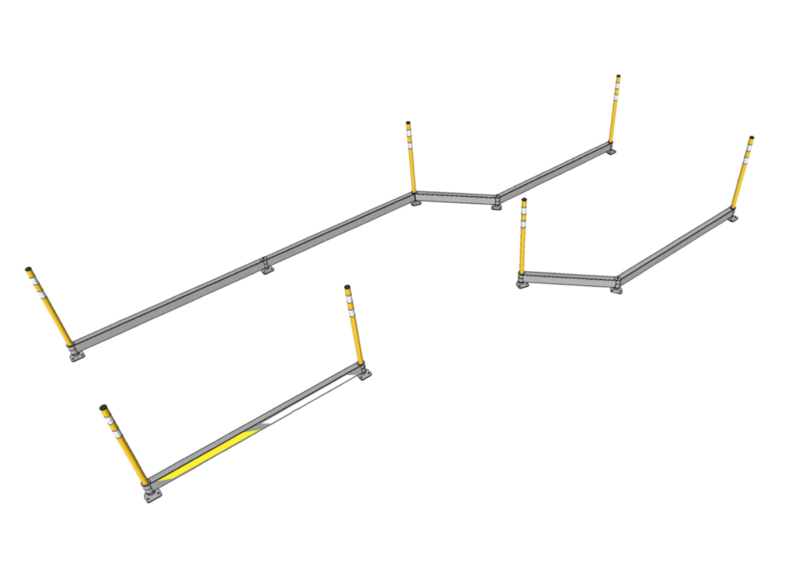 Combine 4′ and 8′ rail lengths to create system’s desired length and configuration. 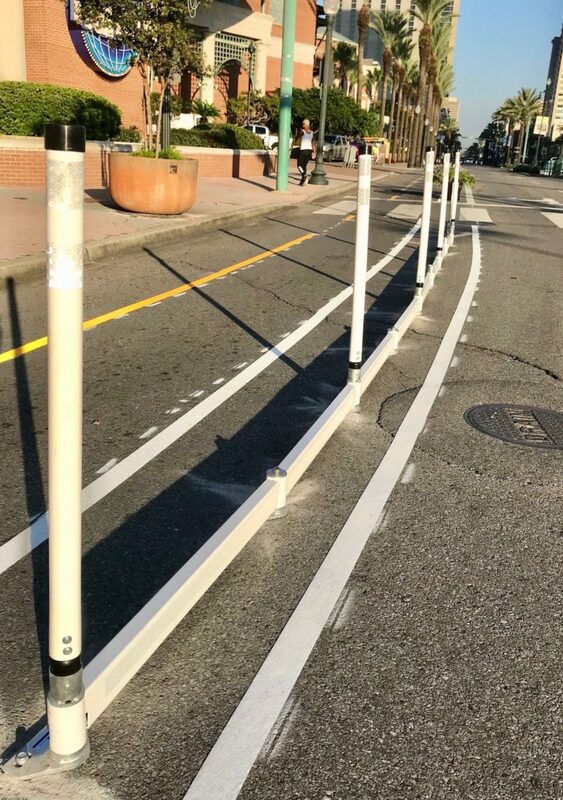 Narrow footprint (5-1/4″) requires minimal buffer space (and easily installs directly over existing white painted lines). 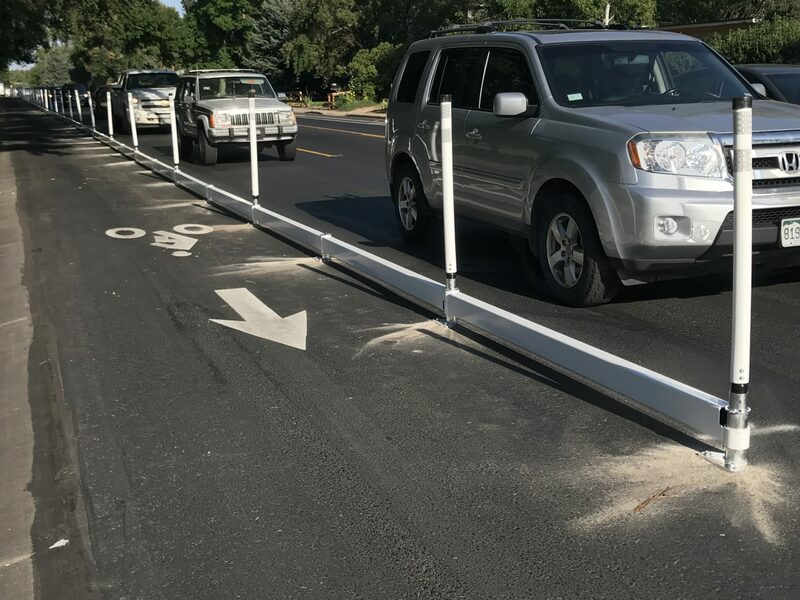 Add Flex Delineators on any or every Post, and specify desired height (from 12″ to 50″ off grade). Enhance nighttime visibility with optional reflective tape; choose yellow or white. Posts rotate 360° for maximum flexibility in anchoring position. 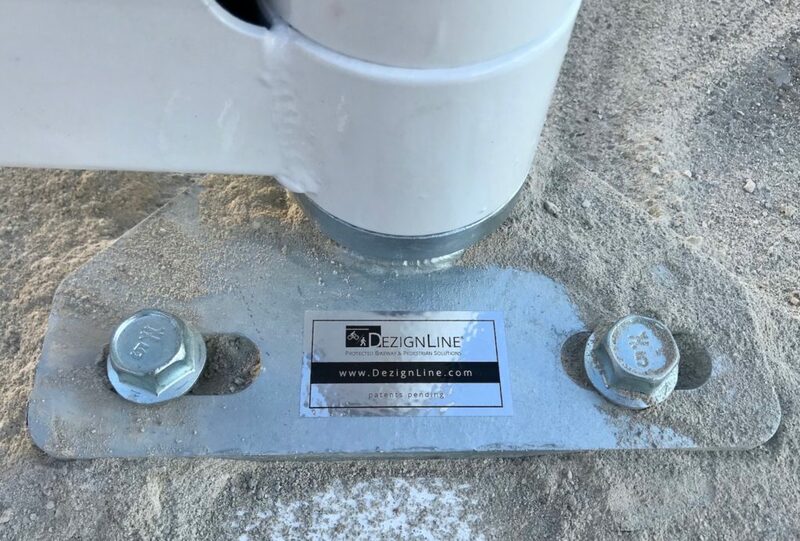 Rails connect at Posts and swivel up to 180° for quick and easy configuration on site. 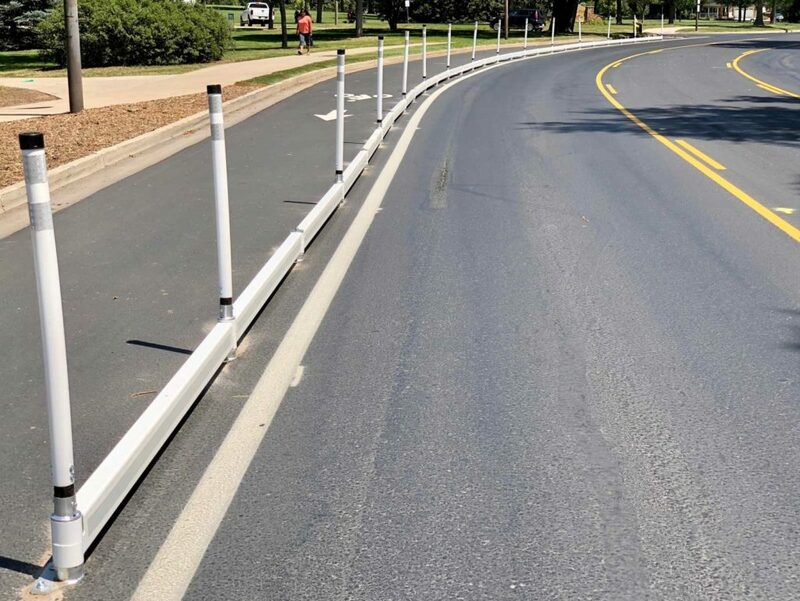 2-1/4” vertical clearance from street to Rail ensures storm water drainage. Modular components make it easy to expand, contract, or reconfigure the system on the fly (which is helpful when field conditions don’t exactly match the site plan). Need to add on or replace a section? 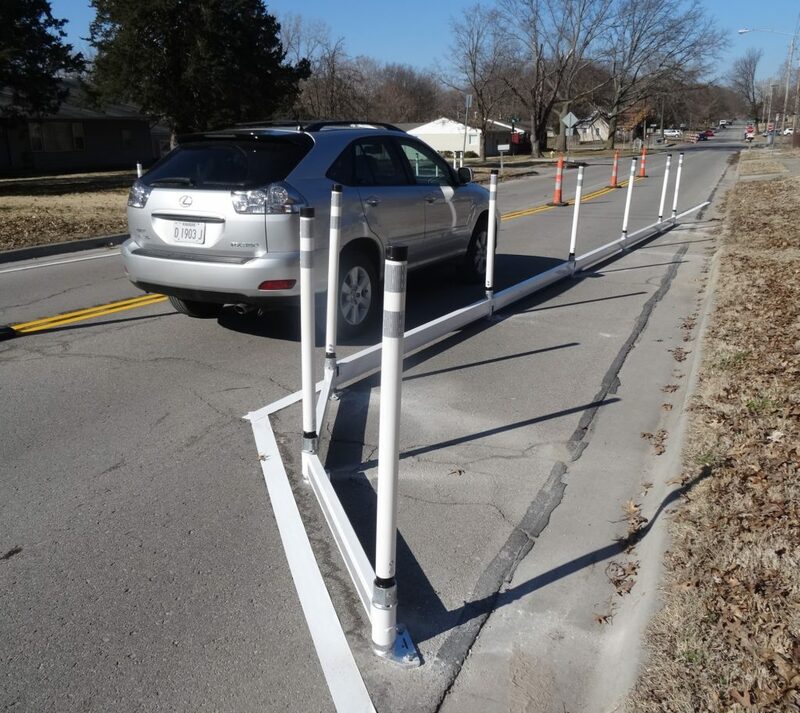 Simply order the rails, posts, and delineators you need to create the appropriate configuration for this or the next project. 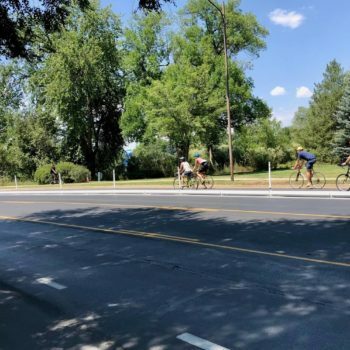 BIKERAIL, Fort Collins on Mulberry St.
For an elegant solution, combine sections of BIKERAIL with STEELGREEN™ Planters to create highly protective and aesthetically pleasing bike lane corridors. 20 standard colors (below), and multiple custom colors. To browse photos of completed BIKERAIL™ installations, click on an image to launch the photo gallery viewer. Sample installation videos of completed projects. 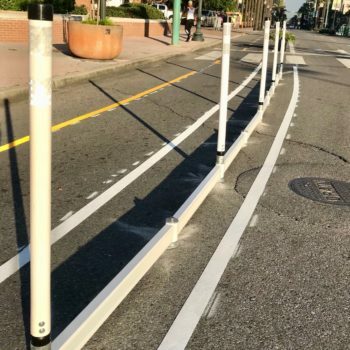 1,400 Linear feet installed in 5.5 hours: combination of BIKERAIL and CURBRAIL. 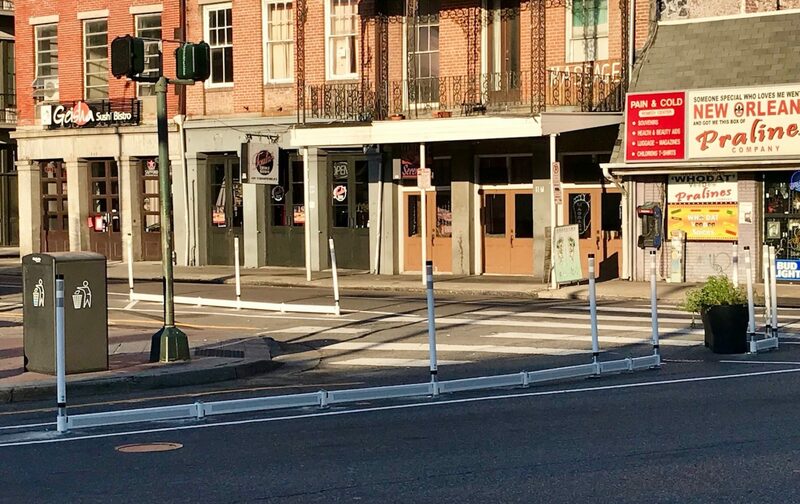 How can DEZIGNLINE™ safety infrastructure help your community?